Take mangoes, peel the skin and make small cubes. Take a pan, add 1 cup of water, mango cubes and boil it till it becomes soft. Strain the water but collect the water in a pan. Add 1 cup sugar, 1 cup water in the strained water and boil it again, stirring occasionally till sugar dissolves. 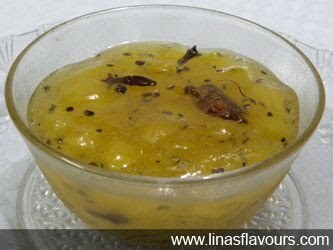 Add mango cubes, cinnamon, cloves, saffron and cook till it turns into syrup-chasani of one thread consistency. To check it, take a drop, put it between your thumb and index finger and press it. When you separate your fingers it should form a thread. Let it cool down slightly. Add cardamom seeds and cool it completely. Store it in air-tight container and place it in a cool place.